October is American Archives Month—an opportunity to raise awareness about the value of archives and archivists. There is strength in numbers, and our collective voice can be more powerful than individual voices when we set aside time each year to celebrate our collections. Since 2006, the Society of American Archivists has provided members with public relations kits that offer practical information and great ideas to help you make your archives program more visible. You can access past PR kits by clicking on the graphic images to the right. Additional tips and tools are contained in supplementary material ("Get Started!"). Whether you're interested in planning an event, issuing a press release to attract media coverage, or prepping for a media interview, these "evergreen" resources will assist you in enhancing public awareness of your repository—and your profession! Share your American Archives Month activities: send a note about what you did to participate to archivesmonth@archivists.org. American Public University System’s (APUS) University Archives Center will host the Panhandle Documentary Heritage Preservation Workshop October 12–13, 2012, at its Academic Center in Charles Town, West Virginia. The event, co-sponsored by the Humanities Alliance of Jefferson County, coincides with American Archives Month and will feature a forum-style workshop with six sessions focusing on the management and preservation of physical and digital heritage materials including archival records, photographs, and artifacts. For more information or to register, contact Brad Wiles at bwiles@apus.edu. The Oregon State Historical Records Advisory Board printed and widely distributed an Archives Month poster commemorating the Centennial of Women's Suffrage in Oregon. In addition, the State Archives is having an open house on Saturday, October 13, 2012, from 10 a.m. to 3 p.m. At this event, our new exhibit, "Centennial of Women's Suffrage and Milestones in Women's Political History," will be introduced in the exhibit hall. California archives, libraries, museums, and historical societies are encouraged to plan special events or exhibits that highlight their collections of valuable documents and artifacts to celebrate Archives Month. Participants are invited to share their Archives Month event on the California Archives Month website by emailing details of the event to info@calarchivesmonth.org. Be sure to include the event title, name of repository, location of event, dates, contact person, and website (if available). To view events, visit the California Archives Month calendar. To celebrate American Archives Month, Swem Library's Special Collections Research Center is asking individuals to vote for their favorites from among thirty selected items from their rare and unique holdings. In this three-part contest, individuals are asked to choose their favorite William and Mary-related item, the most surprising entry, and the most interesting historical item. Click here for more information. Along with archivists, records managers, students, and friends and supporters of archives, Governor Nathan Deal signs a proclamation designating October as Georgia Archives Month, Sept. 19, 11:00 a.m. Come to the photo shoot to show support, and visist Georgia Archives Month on Facebook! The Herschell Carrousel Factory Museum will offer the final installment of its Carrousel Chat lecture series for the year on Thursday, October 18. Stacy Person, project development specialist in the Digital Collections Group of the University of Buffalo Libraries will be at the museum to discuss the emerging importance of digital archival collections. Person will explore the many uses, benefits, and challenges of digitizing archives, and highlight some of the treasures of UB's holdings. 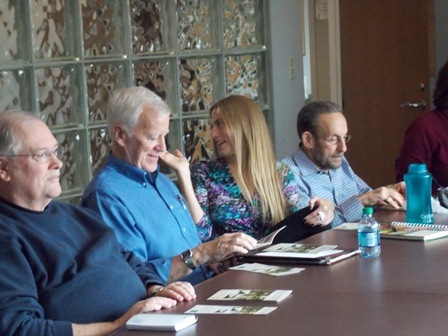 (From left to right): Chuck Sherland, Walkerton Historical Society; Brother Larry Stewart, Congregation of the Holy Cross Brotherhood Archives; Alison Stankrauff, Indiana University South Bend Archivist and Associate Librarian; and David Piser, Michiana Jewish Historical Society. Indiana University South Bend is celebrating American Archives Month by hosting a Library of Congress digitization workshop. This workshop is taught by a professional librarian who has completed the Library of Congress’ Digital Preservation Outreach and Education (DPOE) Train-the-Trainer Workshop, Midwest Region, in Indianapolis, and who is certified to deliver the DPOE Baseline Digital Preservation Curriculum. The workshop will be tailored to those largely in smaller institutions—small archives, museums, library local history rooms, and historical societies. Institutions of this size and genre are the bulk of the repositories in the area. The workshop will be marketed to the “Michiana History Group”—the informal group of archivists, museum professionals, librarians, and volunteers of all stripes that meets monthly or bimonthly to network, discuss concerns, and exchange ideas. Illinois Archives Month is jointly sponsored by the Illinois Secretary of State, the Illinois State Archives, the Illinois State Historical Records Advisory Board, and the Chicago Area Archivists (CAA)—with grant support from the NHPRC. A list of celebratory events is avilable here. To celebrate American Archives Month and Georgia Archives Month, the Jimmy Carter Presidential Library & Museum in Atlanta hosted an exhibit featuring copies of photographs related to Admiral Elmo Russell "Bud" Zumwalt Jr. In conjunction with the exhibit, Larry Berman, author of Zumwalt: The Life and Times of Admiral Elmo Russell "Bud" Zumwalt Jr., visited the library for a reading and book signing. The Litchfield Historical Society in Litchfield, Connecticut, will host a variety of programs and lectures throughout the month, and will host the opening of the traveling exhibition "There's a Map for That!". Click here for a complete calendar of events. In addition, the organization will post one document, photograph, map, or other item from the collection per day on its Facebook page, along with an archives Word of the Day. To celebrate American Archives Month, the staff and interns at Loyola Marymount University, Department of Archives and Special Collections, published a monthlong, five-part series on the William H. Hannon Library's blog that highlighted archival collections and showcased efforts to preserve records. The department also participated and exhibited at the Los Angeles Archives Bazaar on October 27. The conference will address how new challenges and opportunities are shaping preservation strategies. Within this framework, speakers will focus on conservation, reformatting, storage technology, and the ways in which these program activities are evolving toward new solutions. A session on education and outreach will highlight innovative methods to share information and engage users through social media and training. Our Keynote Speaker is Mr. David M. Rubenstein, noted philanthropist, collector and co-founder of The Carlyle Group. New York Archives Week, an annual observance of the importance of archival and historical records to our lives, is coordinated in New York City by the Archivists Round Table of Metropolitan New York, Inc. View a calendar presenting a brief overview of the various New York Archives Week events occurring on each day and details about each event, including RSVP instructions. For the latest news about New York Archives Week visit the Archivists Round Table of Metropolitan New York, Inc., or join the group on Facebook! The Newnan (Georgia) Carnegie Library Foundation, in partnership with the Universtiy of Georgia's Hargrett Rare Book and Manuscript Library, offered a "white glove discovery" lecture on Georgia history during Georgia Archives Month 2012. The lecture, held October 11, launched the foundation's Edgar B. Hollis Distinguished Lecturer Series and showcased original documents and artifacts on the subject of "Georgia as a Colony." Two other lectures complete the Hollis series for 2012–13: "Native Americans in Georgia" (November 15) and "The Civil War in Georgia" (January 15). To commemorate American Archives Month, the Niagara County Historians Office and the Niagara County Clerk's Office put together an exhibit for the cases in the courthouse rotunda. Complete with architectural line drawings, photographs, and even some salvaged building materials, the exhibit chronicled the development of the 1882 Court House and its additions, along with the County Clerk's building (1856) located across the street. The Society of North Carolina Archivists created a promotional poster and bookmark to raise awareness. 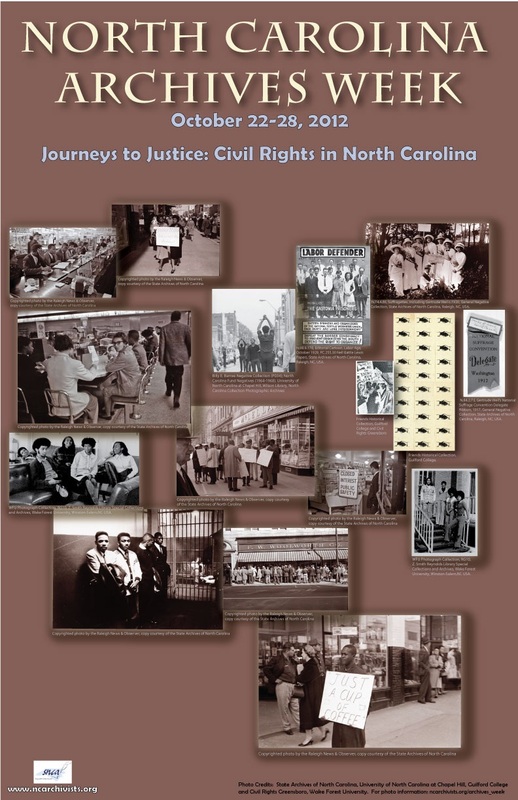 Civil War to Civil Rights in North Carolina: An exhibit in the State Archives featuring documents and photographs relating to the Archives Week theme, "Journeys to Justice: Civil Rights in North Carolina." Click here for more information. Archives and Digital Access: Exploring How Materials are Put Online and How Researchers Use Digital Objects: Samantha Leonard, the Digital Production Manager of the Triangle Research Library Network's LSTA-funded grant "Content, Context, and Capacity: A Collaborative Large-Scale Digitization Project on the Long Civil Rights Movement in North Carolina" spoke about how the grant makes archival materials from various institutions available online. Professor Jerry B. Gershenhorn, author of Melville J. Herskovits and the Racial Politics of Knowledge, spoke about his research experiences as a professor and historian using digital projects. Tour and Archives Week Celebration: The Southeastern Community College Library hosted a special event that began with a tour of a visual display created by Southeastern art students and featured speakers Selena Rowell of Columbus County Partnership for Children and Author L.D. Dockery. Click here to see pictures of the event. Brown Bag Lunch: The University of North Carolina at Chapel Hill hosted a brown bag lunch discussion on "Twentieth Century North Carolina Civil Rights in the Archives: Materials in the Reading Room and Online." The Listening Project—Guilford Integration: 1962 Before and After, An Oral History: The Friends Historical Collection presented this public event in which community members could listen and reflect on recorded reminiscences of 1960s and 1970s era students, faculty, and friends of the college. Digitizing and Remote Sharing of Family Materials: A family history workshop featuring three speakers from the State Archives of North Carolina who spoke on the digital preservation of family papers and photographs and the ease of sharing family information in a digital format. Click here for more information. Armchair Historians: Tools You Use at Home or on the Go: Archivist Ashley Yandle guided attendees through online tools and social media including the State Archives catalog and the North Carolina Digital Collections. Click here for more information. Triangle Home Movie Day: Triangle Home Movie Day is part of a worldwide celebration of amateur home movies, during which people throughout the world meet local film archivists, find out about the long-term benefits of film versus video and digital media, and get to watch old family films. Click here for more information. The Ohio Historical Records Advisory Board invites individuals to celebrate Archives Month by recognizing the accomplishments of an Ohio institution in preserving and improving access to historical records. Nominations are due by October 1; for more information, click here. After the Riverside County Archives received proclamations and resolutions from their governing board to commemorate Archives Month, the archives enjoyed local press coverage. This Press-Enterprise blog post describes the archives' involvement in American Archives Month and why recordkeeping matters. The Rock and Roll Hall of Fame and Museum's Library and Archives will host The Peoples of Ohio: Musicians and Music from Polonaise to Polka and Punk on Tuesday, October 2. The event will showcase materials housed in the library and archives as well as in other local libraries and archives that relate to Ohio music and musicians. Local singer-songwriters will perform from handwritten song lyrics housed in the archival collections as well. Click here for more information. To commemorate American Archives Month, Sister Jeanette Fettig, director of archives and records for the Sisters of the Holy Cross, shared stories of individuals who requested information from the archives in the congregation's weekly announcements. A variety of stories were included in the announcements, from a student requesting information for his dissertation to an individual inquiring about artists in the Sisters of the Holy Cross congregation. This initiative helped to spread the word about the benefits of archives and the fascinating discoveries that can be uncovered. On this page, find the Texas Archives Month poster, ideas for celebrating Texas Archives Month, official Texas Archives Month proclamations, and a calendar of Texas Archives Month events. To celebrate American Archives Month, Arkansas Governor Mike Beebe declared October 21–27 as Archives Week in Arkansas. The University of Arkansas at Little Rock's Center for Arkansas History and Culture (CAHC) celebrated by creating a four-part series highlighting various aspects of the archives, which can be found here. In honor of American Archives Month, the University of Texas at Austin student chapter of the Society of American Archivists (SAA-UT) will host a series of events October 22-27 inspired by the impact of fashion and clothing on our cultural heritage, and their role as part of our enduring cultural heritage. For a listing of events and more information on Archives Week, visit http://www.ischool.utexas.edu/~saa/archivesweek.html. In honor of Archives Month 2012, the Society of American Archivists Student Chapter at the University of Wisconsin–Madison featured stories about unique collections from participating archives and historical societies throughout the state during the month of October on the blog 100 Years of the Wisconsin Idea: Forward Through the Past. The Library of Virginia, in conjunction with the Virginia State Historical Records Advisory Board, the National Historical Publications and Recrods Commission, and the Mid-Atlantic Regional Archives Conference, is inviting the public to join in the celebration, "Boxes to Bandwidth: Reconstructing the Past for the Future," by sharing the Archives Month poster. Created from images submitted from nineteen archival repositories throughout the state, this poster highlights Virginians' rich history of service, innovation, creativity, and artistry with images from Virginia archives and manuscript collections. Additionally, numerous programs and lectures are scheduled at institutions throughout the state; click here for a complete list. In celebration of National Archives Month and North Carolina's Archives Week, the Z. Smith Library Special Collections and Archives at Wake Forest University launched Documenting Diversity, an initiative that sought to identify, locate, secure, and make accessible important and at-risk historical records. The archives asked departments and student groups across campus to deposit their paper and electronic documents in the archives, particularly encouraging records from underrepresented groups, such as WFU's ethnic minority, LGBTQ, and international communities. To celebrate Archives Month 2012, the Washington State Historical Records Advisory Board, the Washington State Archives, and the Washington State Historical Society present The Basics of Historical Research, a free workshop to be held on Saturday, October 20. This three-hour workshop is recommended for teachers, students, beginning genealogists, and others who are interested in exploring the past. Participants will learn the basic steps for gathering information and interpreting a historical topic for a museum exhibit, class project, community celebration, or personal interest.